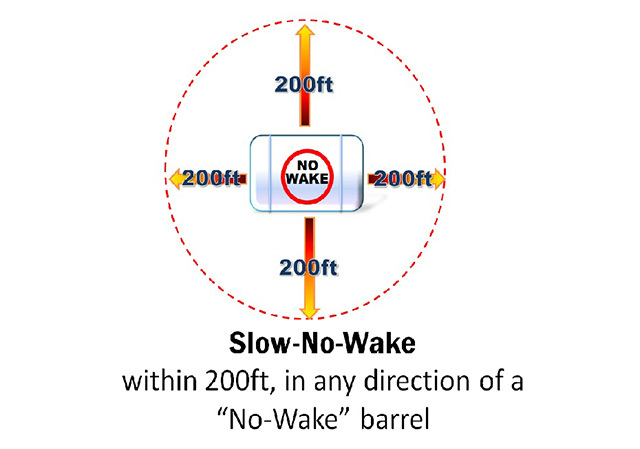 How can I Request a “Slow Speed, No Wake” barrel? A1: All requests for a Slow Speed No Wake can be made to the New Jersey Department of Environmental Protection, Bureau of Coastal Engineering. 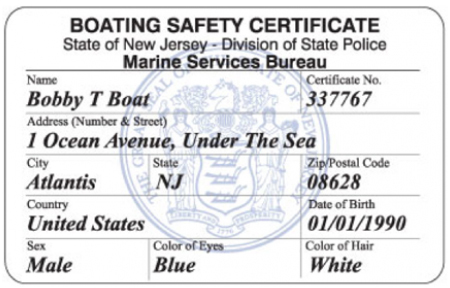 They will contact the New Jersey State Police< Marine Services Bureau to determine the feasibility of the request. I found an abandoned boat, can I use it as my own? A3: Speed or No-wake is regulated by both, Title 12:7-45 Speed of Power Vessels and Title 13:82-1.7 Speed. It states that the speed of a power vessel should be regulated to avoid injury or damage to property. Additionally, if you are within 200ft of any marina, pier, dock or waft; work floats or barges engaged in work; through bridge openings less than 400ft wide; through waterways less than 200ft wide; vessels not under command; any vessel with flashing emergency lights activated. What does this mean? Within 200ft of any of the above listed conditions you are required to operate your vessel at minimum headway speed, regardless of the presence of a sign or buoy. If you are causing a wake, you are going to fast! Also, see the below diagrams for more common meeting situations. What is the appropriate action of each vessel operator? A boat is drifting in the channel and I am trying to get by it, who has the right of way?